Here’s a startling truth. I can make you fat. In fact, it is pretty simple to do. Actually, I can make anybody fat quite easily. How? I simply prescribe insulin injections. Sounds simple, doesn’t it? Well, it is! Giving people extra insulin leads inevitably to weight gain. All that is required is to raise a persons insulin and they will become fat pretty quickly. In type 1 diabetes, when insulin levels are extremely low, patients lose weight no matter how many calories they eat. They can eat and eat all they want and never see the side effects of added weight (even to the extremes where they are eating excessively but rail thin). So, to summarize, give insulin – gain weight. No insulin – lose weight (even to the point of death which, of course is something all try to avoid). The implication is clear and that is that insulin causes weight gain and thanks to this fact, I know I can make you fat. Knowing this is crucial because if insulin causes weight gain, then losing weight depends upon lowering insulin. Logical right? But instead of taking this fact and running with it, we’ve been told to focus obsessively on calories. If you have ever considered trying to loose weight, you have surely heard this before and almost every diet out there will tell you the same. Why is the focus never on insulin levels? 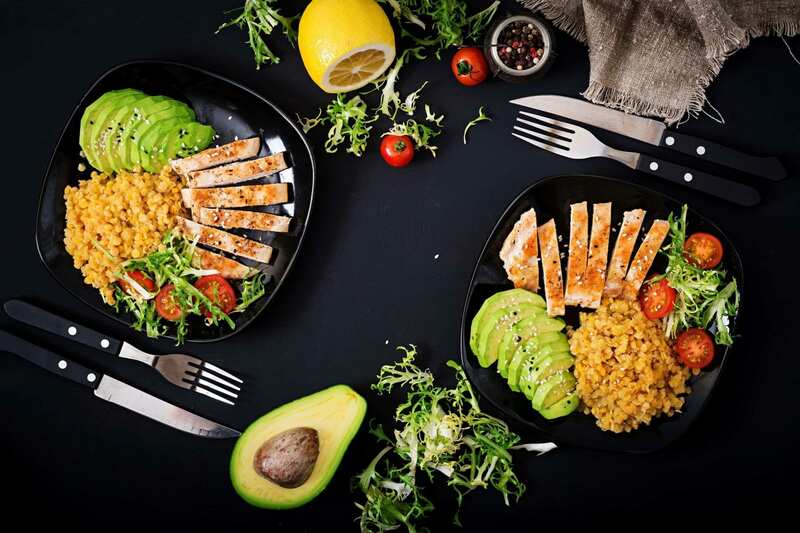 The standard (and almost always failed) weight loss advice is to restrict a few calories every day by reducing dietary fat and eating multiple times per day. Small meals, less fat, lower calories is suppose to lead to weight loss. Sound familiar? This does not lower insulin much since dietary fat has little insulin effect and eating frequently constantly stimulates insulin secretion which is actually the opposite of what you want if you are looking to lose weight. This ‘caloric reduction as primary’ advice has an estimated failure rate of 99.5%. So, if you have tried calorie restriction to lose weight and failed, understand this. You were expected to fail. You almost had no chance of trying to lose weight in this manner and succeed, unless you are one of those .5% that it did work for but who are we kidding, they probably didn’t lose much weight either unless they made some other life change at the same time. So here’s the situation. ‘The Man’ tells you that obesity is a caloric balance and that you should eat less and move more. Sounds simple but then ‘The Man’ tells you to eat a low fat diet, and to eat 10 times a day. Sounds a little harder and more of something that would be difficult to follow for an extended period of time. Because of this, this advice fails virtually everybody. And then, to make matters worse, when you fail, ‘The Man’ tells you it’s your own fault for being such a lazy, weak willed person who can’t stick to a diet or follow simple habit forming instructions. His advice was good, ‘The Man’ tells you. You were just a failure. That’s what ‘The Man’ wants you to believe. But he is wrong and you need to start believing that the advice is wrong, not you. A good way to look at this caloric misinformation is to imagine we have a classroom of 100 pupils. One of these people fails. When one person out of 100 fails, it’s likely his fault. Maybe he played too many video games or didn’t come to class. Maybe he didn’t study or just wasn’t smart enough to pass the class. Whatever the reason, only on out of 100 failed. But what if 99 students fail? Then it’s not a problem with the students. The problem is with the teacher. In this scenario, this is obvious to us. Everyone fails, the teacher or the class itself is at fault and it is clear. In obesity, the problem of rampant obesity means that it is very obviously not the fault of the people. Too many people are obese and the problem is not the people. The fault lies with the official dietary advice. We often think and talk about the first problem, but both are equally important in lowering insulin levels. Even if you eat an extremely healthy diet and count every calorie, avoid every fat, and eat clean, the matter of when still applies and needs to be careful taken into consideration. The three different macronutrients stimulate insulin to different degrees and are what you should focus on when trying to lose weight. Knowing how each effects the body is essential so this is something you will want to remember. Carbohydrates, particularly refined carbohydrates raise insulin the most. From the moment you eat a carb, your insulin is going to shoot up practically immediately. Protein also raises insulin significantly, although blood glucose remains stable. Eating protein won’t have as drastic of an effect on your insulin levels but it will effect it some. In addition, animal proteins stimulate more insulin release compared to plant proteins. Dietary fat raises neither glucose nor insulin. That’s right, fats do practically nothing to your insulin levels. Most natural foods contain varying combinations of the three macronutrients and therefore raise insulin to varying degrees. For example, refined carbohydrate-rich foods like cookies have the greatest effect on raising insulin and glucose. Fat rich foods like salmon have little effect on insulin which is why it is featured in almost every diet out there. However, this differing ability to stimulate insulin means that foods also differ in their fattening effect. This is only common sense and when you think about it, you will see how easy it is. Here is a perfect example, 100 calories of cookies, is far more fattening than 100 calories of salmon, despite what all the obesity ‘experts’ claim. The calories just aren’t the same once they enter your body. Certain factors increase insulin which encourages weight gain. The most important factors and foods that raise insulin are refined carbohydrates, animal proteins, and insulin resistance. Fructose, from added sugar and fruits, can directly cause fatty liver and insulin resistance. This leads the body to increase insulin secretion to compensate which, of course, leads to weight gain. Other factors decrease insulin, protecting against weight gain and these are the ones you want to remember in order to lose weight. Acids found in fermented foods (sauerkraut, kimchee) and vinegar lowers the insulin effect of foods. That means that having some vinegar on your salad is really helping your body fight fat so add some more of that dressing! Animal protein causes secretion of incretin hormones that slow the absorption of foods thus lowering insulin. Thus meat has both pro- and anti-insulin effects making it almost a neutral food. Fiber also has this same effect of slowing absorption and insulin effect. A bowl of oatmeal is a healthy way to start your body off on the right track for the day as it is full of fiber and will help lower your insulin levels. Funny. That’s precisely the sort of no-nonsense advice your grandmother would have given. I guess it’s about time you listened to her advice! Our body follows the biologic principle of homeostasis. If exposed to any prolonged stimulus, the body quickly develops resistance. An example of this resistance is a sleeping baby. A baby can sleep soundly in a crowded restaurant because the noise is constant, and the baby has become noise ‘resistant’. But that same baby, in a quiet house, will wake instantly at the slightest creak of the floorboards. Since it has been quiet, the baby has no ‘resistance’ against noises and thus awakens quickly. This is the same with your body’s consumption of foods and they cycle of when you eat. This may sound strange, but this is the way we used to eat. Suppose you eat breakfast at 8 am and dinner at 6 pm. You eat for 10 hours of the day and fast for 14 hours. This happens every single day, and the reason we use the word ‘break-fast’. This is the meal that breaks our fast implying that fasting is simply a part of everyday life. The body spends roughly equal portions of every day in the fed (insulin high, storing fat) and the fasted state (insulin low, burning fat – Ketosis). Because of this nice balance, weight tends to stay stable over time. Up until the 1980s, this was pretty standard practice and obesity was not a big issue. We often obsess about the foods we should or should not eat, the question of ‘what to eat’. But we often ignore the equally important question of ‘when to eat’. 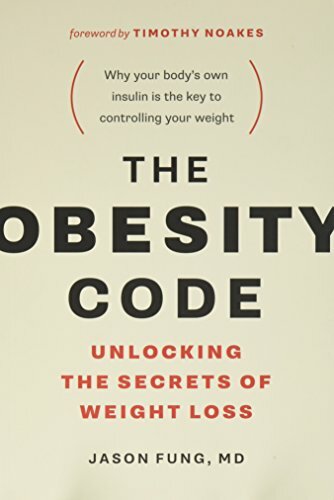 By attacking the insulin problem on both fronts, we have a far higher chance of successfully losing weight. Now you are well informed to begin losing weight in this manner and, when followed correctly (and logically), that weight will fall off! Reprinted with permission from Dr. Fung.